Sustainable Woodstock and the Thompson Senior Center are exploring ways to expand transportation options for all. According to the recent survey to the community conducted by the Thompson Senior Center to hear what seniors feel as their more urgent needs, one of the three most important problems they face is access to transportation. The center mitigates this need by providing scheduled transportation to and from the center at a suggested $1 donation per trip, and scheduled trips to Lebanon medical appointments for $10 roundtrip. It also schedules shopping trips and rides to events. These services, not available evenings and weekends, take significant resources and dedication from the center and its volunteers. Other rural communities around us and across the country address their transportation problem in similar ways, mostly with volunteer drivers donating their time and personal vehicle use to help out, and volunteer coordinators trying to fulfill this need as best they can with limited resources. Volunteers In Action, an organization in Windsor, provides similar services supported by Mount Ascutney Hospital. An initiative by the Department of Transportation, Rides to Wellness, is helping communities develop coordination technology and training to better manage rides specific to health and wellness. However, they rely on existing transportation options. These invaluable services to the senior community are not enough. Aging at home is not just about health and wellness, but also about having the ability to stay connected in myriad other ways. Furthermore, anecdotal evidence suggests that other community groups also feel the lack of transportation options. Examples include high school students attending after school activities, anyone needing temporary access to transportation to get to work, the health center, or getting to or from the Dartmouth Coach, or needing temporary transportation when their vehicle is in the shop, or trying to get rid of their second car, even wanting to go out to dinner or the theater, but not comfortable driving back at night. Access to transportation options is limiting some of our neighbors’ ability to lead a sustainable and inclusive life. The Two Rivers Ottauquechee Regional Planning Commission in its recent strategic plan talks about supporting initiatives that will provide better access and options to transportation, less driving, ride sharing, door to door and curb to curb solutions, as well as help to elders and disability, supporting aging at home, and adolescent travel. What if we could implement a technology based solution, similar to what Uber does in cities, but with a mission to support the community transportation needs rather than to maximize profits? What if the solution would be open to anybody in our surrounding towns, and where the revenue from paid rides would subsidize rides for neighbors that can’t afford it but need a ride? Well, such a technology-volunteer based solution already exists, and Sustainable Woodstock is looking for a few entrepreneurial volunteers to form a new Transportation Action Group to implement such a solution in a very short timeframe. The idea, which is in its infancy and needs development and due diligence, is to develop a public-private partnership between one or more local non-profits and a startup company already deploying this technology in rural midwest, Colorado, and Virginia. Check it out at LibertyMobilityNow.com . If you might be interested and have the drive and background to help implement such an effort, do just one thing, email me (JuanFlorin@iCloud.com) and let’s talk. We have more background research to share and welcome ideas and feedback. Do Just One Thing: Join the conversation about improving local transportation options. 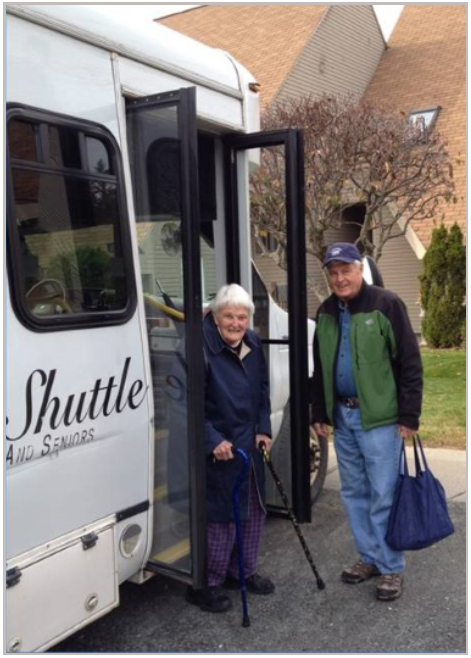 Photo Caption: Sustainable Woodstock and the Thompson Senior Center are exploring ways to expand transportation options for all. Robert, good to hear from you. I am out of town but will contact you upon my return this weekend. The project is moving forward with both the boards of SW and The Thompson discussing next moves for a proposed partnership. I have met with other communities implementing or operating similar solutions as well as with The Thompson to start refining the concept based on their experience. Happy to hear from others.